Obama File 100 Obama's "Faith Adviser" Jim Wallis Mixes With Socialists, Radicals and "Truthers"
What could be a greater guide to a man's true nature, than those from whom he seeks spiritual counsel? President Barack Obama spent 20 years under the ministry of Rev. Jeremiah Wright on Chicago's South Side. Wright is a Marxist and admirer of the founder of "Black Liberation Theology", James Cone - who wrote in 1969 "All white men are responsible for white oppression. . . . Theologically, Malcolm X was not far wrong when he called the white man 'the devil.'" In June 1998 Wright attended the Black Radical Congress in Chicago where he shared a panel with Cornel West and and former parishioner Michael Eric Dyson of the Democratic Socialists of America Religion and Socialism Commission, plus a former Communist Party member from his own Trinity United Church of Christ named Kevin Tyson. The panel was entitled "Faith as a Weapon: Spirituality and the Role of the Church In The Radical Movement." Maybe Rev. Wright even met another Congress participant - a young radical from Standing Together to Organize a Revolutionary Movement, named Van Jones. Today President Obama gets his spiritual nourishment from another source, a leader of American "progressive" Christianity, named Jim Wallis. Jim Wallis is white and oh so smooth and reasonable. 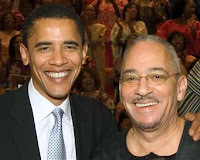 He is no firebrand like Jeremiah Wright. He is a registered Democrat and the respectable face of the Christian left. Rev. Wallis has served on Obama's White House Advisory Council on Faith-based and Neighborhood Partnerships, or "Faith Council" since 2008, but the relationship is personal and goes back at least a dozen years. In early 2008, Wallis a wrote defense of his friend Obama, after the candidate was baited over alleged Muslim allegiances. So let's set the record straight. I have known Barack Obama for more than 10 years, and we have been talking about his Christian faith for a decade. Like me and many other Christians, he agrees with the need to reach out to Muslims around the world, especially if we are ever to defeat Islamic fundamentalism. But he is not a Muslim, never has been, never attended a Muslim madrassa, and does not attend a black "separatist" church. And one Sunday, as Obama has related to me and written in his book The Audacity of Hope, the young community organizer walked down the aisle and gave his life to Christ in a very personal and very real Christian conversion experience. We have talked about our faith and its relationship to politics many times since. And after Obama gave his speech at a Sojourners/Call to Renewal conference in June 2006, E.J. Dionne said that it may have been "the most important pronouncement by a Democrat on faith and politics since John F. Kennedy's Houston speech in 1960 declaring his independence from the Vatican." Undoubtedly, the Obama/Wallis relationship is close. But who is this man, who is obviously as deeply committed to the Christian faith as the President himself? Jim Wallis was raised in a devout Plymouth Brethren household, but broke with the Church at fourteen over its failure to commit to political causes. Wallis went on to join and then lead the militant Students for a Democratic Society, at Michigan State University. After College Wallis went on to attend Trinity Evangelical Divinity School in Illinois where he joined with other young seminarians in establishing the community that eventually became Sojourner. In 1979, Time magazine named Wallis one of the "50 Faces for America's Future. In 1977 Wallis moved his radical Sojourner community, to Washington D.C., specifically to a small district named Columbia Heights, only a mile from the White House. Meanwhile, many of Wallis' old SDS comrades had founded a new Marxist organization with some older Communist Party veterans , patriotically named, the New American Movement. In 1982, NAM, in turn, merged with the Democratic Socialist Organizing Committee to form Democratic Socialists of America. The new organization took penetration of organized religion very seriously, immediately forming a Religion and Socialism Commission. Below is clipping from a July 1982 DSA newsletter, listing the three Religion and Socialism Commission co-chairs. Note the center name Jim Wallace. Spelled differently, but is this a typo? Note the address - Quincy Street - one of five streets running through Columbia Heights in Washington D.C.
Was this actually Barack Obama's future spiritual adviser? Step forward to 2010. Contributing editors to the Sojourner journal, include Black Liberation theologian James Cone and two prominent members of DSA's Religion and Socialism Commission, Cornel West and Rosemary Ruether. n 1987, DSA member Joanne Landy, of Campaign for Peace and Democracy, circulated a statement Against Loans to Chile , calling upon the Reagan Administration to oppose all loans to the anti-communist government in Chile. Jim Wallis signed the statement as did DSA members Noam Chomsky, Michael Harrington, Adam Hochschild, David McReynolds, James Weinstein , Ed Asner and Rosemary Ruether, as well as "Penatagon Papers" leaker Daniel Ellsberg. Incidentally, in 2004, Asner, Ruether and Ellsberg signed another statement calling for an investigation into possible US government involvement in 9/11. An alliance of 100 prominent Americans ... today announced the release of the 911 Truth Statement, a call for immediate inquiry into evidence that suggests high-level government officials may have deliberately allowed the September 11th attacks to occur. Van Jones also signed this statement. No doubt to his lasting regret. Cornel West didn't sign the "Truther" statement, but he, Adam Hochschild and Daniel Ellsberg were all later endorsers of the Progressives for Obama website. West went on to serve with yet another radical Obama mentor, Charles Ogletree on Obama's Black Advisory Council in 2008. He calls Obama his "comrade." West is also very close to William Julius Wilson, who in February 1996 addressed a Democratic Socialists of America organized forum in Chicago - alongside a young local lawyer named Barack Obama. Cornel West has also long worked with Rabbi Michael Lerner - yet another 9/11 "truth" petition signer. In 2005, West and Lerner set up the Network of Spiritual Progressives to challenge " the Misuse of Religion, God and Spirit by the Religious Right". Lerner, like Wallis is an old SDSer. In the period after the formation of the Weather Underground Organization , Michael Lerner and Weathermen Chip Marshall, Jeff Alan Dowd and Joseph H. Kelly moved to Seattle to form the Seattle Liberation Front "to Bring the Revolution to Seattle." A federal grand jury would later indict three of their SLF recruits for a February 17, 1970 attack on a government building. The same year, Lerner was a founder of the New American Movement in Chicago and in the 1980s was active in Democratic Socialists of America. In July 2005 Rev. Jim Wallis and Michael Lerner were the keynote speakers at the launching of Cornel West and Lerner's Network of Spiritual Progressives." Wallis used his talk to lambast the "religious right", arguing that the time has come for the left to take back American religion. President Obama has a more than25 year history with the Marxists of Democratic Socialists of America. Barack Obama has several DSAer personal friends , including Congressman Danny Davis, Quentin Young, Timuel Black and the late Rabbi Arnold Jacob Wolf (also a member of DSA's Religion and Socialism Commission). The President has appointed several DSA connected activists to key positions, including Ron Bloom, David Bonior, Rosa Brooks, Carol Browner and Hilda Solis. Is the President's "spiritual advisor" cut from the same cloth? Jim Wallis, is socialist, a fervent believer in the state redistribution of wealth. He is connected to some of the most radical people in America. Wallis works hard to portray himself as moderate and a "bridge-builder". He is a Bible scholar and comes across as sincere and as trustworthy as the President himself. But maybe the millions of Christians and Jews who voted for Obama, should remind themselves that it is not only men of God who can quote the Scriptures to suit their purpose. Why is it such a big negative to be a "Truther"? This is classic Newspeak in action! A "Truther" with regard to the 911 infamous event is simply a group or an individual who believes that persistent inconsistencies and questions remain. In fact, millions of Americans feel that way, so by sarcastically referring to anyone as a "Truther" one is employing ad hominum attack to silence anyone still harboring questions and doubts. This is not good because in essence free independent critical thinking is stifled! T. Moore- a truther, as Mr. Loudon's article helpfully defines, is someone who calls "...for immediate inquiry into evidence that suggests high-level government officials may have deliberately allowed the September 11th attacks to occur. T. Moore, my argument with the 9/11 Truth is simple. basically, it is being used to divide and embarrass the right. Follow the link in the post above and look who signed that petition with Van Jones. Several key leftists affiliated with DSA and the foreign intelligence connected institute for Policy studies, that's who. Little grey men, in Moscow and Havana spend their days making up stories like this to feed to gullible American patriots. Doesn't Wallis and other Christian Marxists understand that Marxism and Christianity are in opposition? When I was younger and more naive, I didn't have it in me to understand the dichotomy. While I knew that Marx believed religion to be an "opiate for the masses," I thought that some Marxists could in fact be Christians who longed to give what they had to the poor. Sounded right in line with Christian principles. The problem is that, ultimately, the totalitarian or oligarchical roots of Marxism lead to the obliteration of free choice -- one of the keystones of Judeo-Christian doctrine. Humanity has a fallen nature, but a free one. The individual is given free will, and that concept is something that MUST be excluded from Marxist/Maoist/Communist states -- because in those Benthamite societies, the individual is sacrificed to the "good" of the Collective. In reality the greatest good for the collective is not health care or social security but individual freedom. How many old SDS-ers are there?????? Didn't ANY of them get "mugged by reality"????? Thanks again, Trevor. Your service to this country is invaluable.